Did I mention that it’s hot here? Horribly hot. 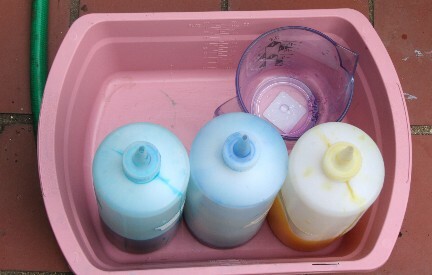 Hot enough to fry eggs on the sidewalk, so, I decided to dye silk on the sidewalk. Or at least to dye it in some of my long pans outside on the front porch. Armed with a little plastic tub and some dyes in squirt top bottles (Procion H for silk), along with brushes and gloves, I went to work. I uniformly scrunched the silk — sort of a lazy man’s version of even pleating — and put it into the tray. 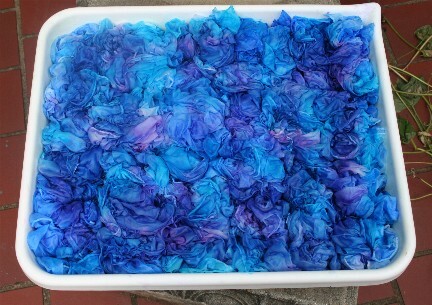 The first dye bath was blues and purples. 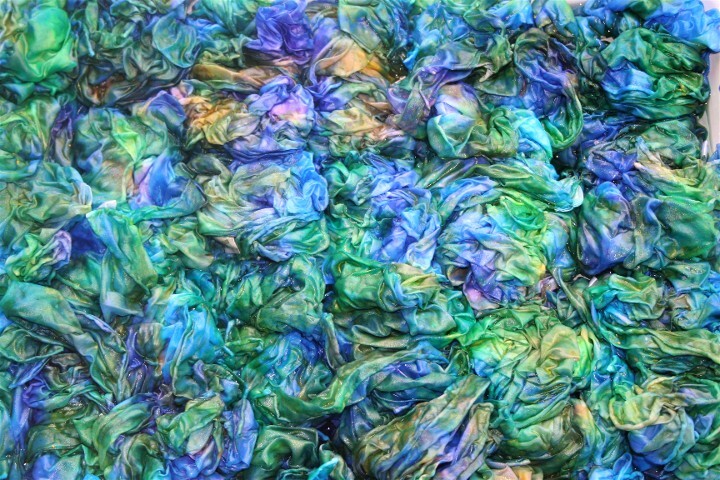 Actually, I need to back up and tell you that after soaking the silk in vinegar, I put it into a very pale blue dye bath, and put down that first layer evenly over the silk in an extra large pot. So outdoors was the first varigated layer. I did the first side and then gently lifted the silk and turned it over, maintaining the "scrunch" and repeated the colors on the back side. I let this heat up and then covered it in plastic, followed by aluminum foil, which quickly caused the temperature to soar. I let it sit for close to 24 hours. This was followed with a second layer of color, which will hopefully produce highlights. This second bath will sit, again covered, for another 24 to 48 hours, or as long as I can stand it because I’m dying to see the results. After rinsing, the silk is reconditioned (sort of like conditioning your hair) and voila, hopefully, beautiful hand-dyed silk. If you’re interested in seeing more detail about this method, I have a full tutorial on Paula Burch’s fabulous dyeing website. There is a link in the upper right hand corner of this page. As if all that fabulous silk wasn’t reward enough, the children were playing outside in our very parched yard while I was working. I was finishing up when I heard Ellie say "a butterfly!" It was an amazing butterfly, only the second one we’ve seen this week. Isn’t it beautiful? The silk looks luscious. Be sure to post photos of the finished product. 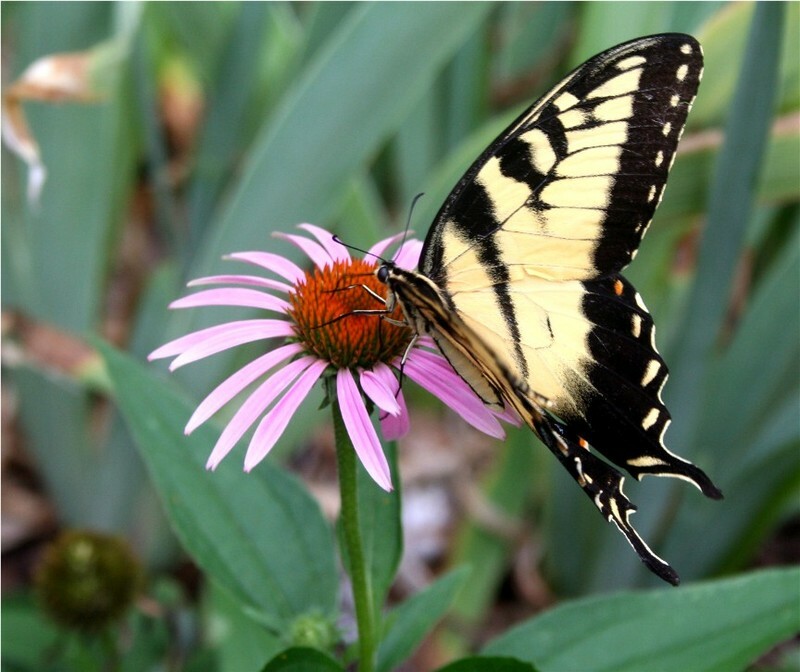 And, the butterfly photo is amazing; great shot. That silk is going to be beautiful, I can’t wait to see the finished product! Oh wow lovely silk!!! i have not tried spinning with it yet but hope to soon though when get the extra $$$!! a bit chicken yet to try!! will do alpaca next and then have some bamboo!! the colors are yummy! and was hot here too and more on the way this week am so not looking forward to that!!! yuck hope fall gets here soon!! !